The Running Rosary program lays out exactly how you can begin praying the Rosary while exercising to nurture your mind, body and soul and guide you on your path to discipleship for Jesus Christ. Author, Christina Frye, gives an intimate look at how praying the Rosary when faced with troublesome times transformed her and her family into true disciples of Christ and brought them a real-life miracle. Do you feel as if there is not enough time in the day for prayer and exercise? Do you struggle to pray the Rosary each day? Does your exercise and/or prayer life need a boost? - How to make exercise habits that will last. - How to utilize the “power of prayer” to boost your workouts. - How to use the Rosary to dig deeper into the Gospels. -Why the Blessed Virgin Mary wants us to pray the Rosary. Christina Frye, author of “The Running Rosary,” gives an intimate look at how praying the Rosary when faced with troublesome times transformed her and her family into true disciples of Christ and brought them a real-life miracle. The Running Rosary can help you combine prayer and exercise to benefit your mind, body and soul and guide you on your path to discipleship for Jesus Christ. 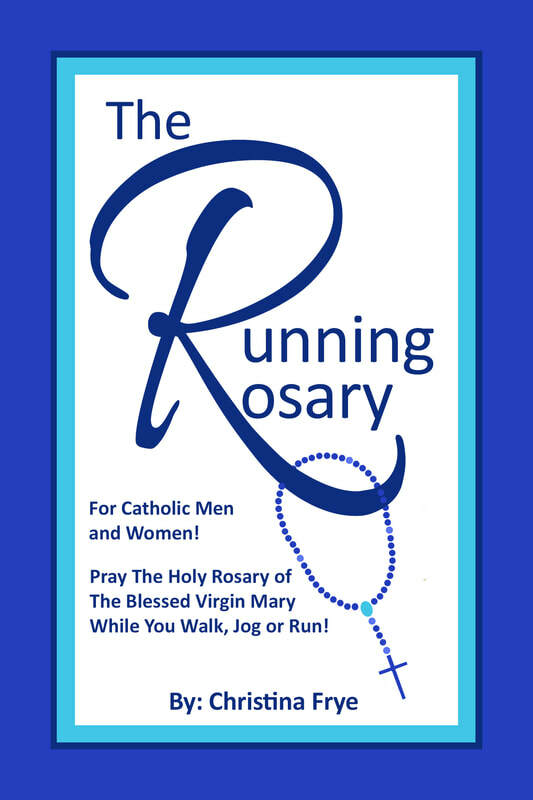 The Running Rosary ebook by Christina Frye, Catholic Mom Rhode Island © 2018 All rights reserved. ​The Running Rosary written by Christina Frye. Cover by Christina Frye. © 2018 Christina Frye. All rights reserved. No portion of this book may be reproduced in any form without permission from the publisher, except as permitted by U.S. copyright law. For permissions contact: CatholicMomRI@gmail.com. This eBook is for general informational purposes only. The author is not a medical professional and nothing in this publication constitutes medical advice. Any exercise program, including the exercise routines outlined in this publication, may result in injury. To reduce the risk of injury, consult your doctor before beginning any exercise program. The materials presented in this publication in no way substitute medical counseling. You must not avoid or delay medical treatment because of anything contained in this publication.